Above: Little books about Lancaster County by John Fass. 1950s. Hand-printed in his room at the Bronx YMCA. "The Hammer Creek Press"
My new website about John Fass is now online, here. John Fass is Lancaster County's great claim to fame in the world of the 20th century book design and private press printing. John was a Pennsylvania Dutchman from the village of Lititz, Lancaster County. He was born here in 1890. (And he died here in 1973.) After working in the pressroom of a Lititz newspaper, he left home to seek fame and fortune in New York City. He found no fortune in the Big Apple, but in the 1920s and 30s he became one of the best American typographers and book designers. 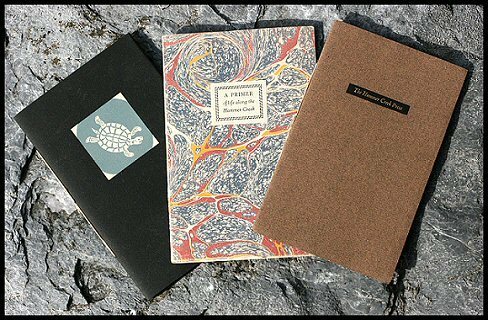 John Fass is celebrated, today, for the intimate little books he created in the 1950s from the cramped apartment room at the Bronx YMCA. 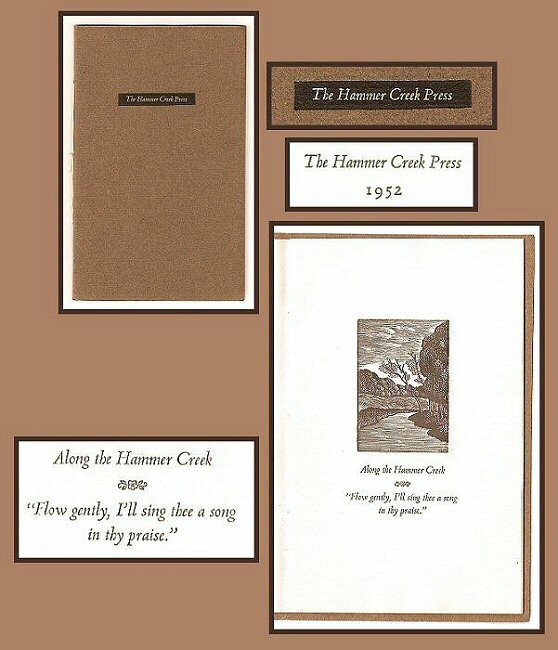 He printed his books with the name "Hammer Creek Press," in memory of the Lancaster County stream of his childhood. John frequently returned to his family home here in Lititz, where he maintained rooms with his sister Esther Wert. He finally returned here to Lititz to stay, and lived the last years of his life near the sunfish and turtles of his favorite creek. Above: A Note on the Hammer Creek. A little book by John Fass. John printed a brief history of Lancaster County in this book, based on the 1883 History of Lancaster County, Pennsylvania, authored by Ellis and Evans. John Fass lived at the Bronx YMCA for 15 years, while working as a typographer for Madison Avenue advertising agencies. During this time he printed more than 50 projects, for his own pleasure, on a tapletop Hughes & Kimber Albion press. He received the press from the illustrator Valenti Angelo in 1950, who one year earlier received the press from Bruce Rogers of The Riverside Press in Cambridge, Massachusetts. Bruce Rogers was one of the most influential American typographers and book designers of the 20th century, and had much influence on the John's design sensibilities. Above: A Primer of Life along the Hammer Creek. A Little Book by John Fass. John DePol (born 1913 - died 2004) is one of the best-know American wood engravers. He was a native of New York City, where he worked for various commercial printing and publishing companies. John DePol illustrated numerous books created by his friend John Fass. The University of Delaware Library has the papers, photographs, and archives of both these artists, Here and Here. Above: Along the Hammer Creek a wood engraving by John DePol. John Fass printed this pamphlet to showcase two John DePol wood engravings. DePol and his wife Thelmas visited John Fass on various occasions in Lititz, where they all had a chance to get his feet wet in the Hammer Creek. In 1998, the Rochester Institute of Technology published a biography / bibliography of John Fass and his Hammer Creek Press. It is Here. "Fass was essentially a private printer, working alone at his own pace. What he did was done for his own pleasure. But his work, small in size and issued in minuscule editions, was exquisite and executed with impeccable taste. He was a genius at the arrangement of type, ornaments, and wood engravings. Every piece he produced was a small gem, for Fass had the time, skill, and materials to print everything by hand patiently and perfectly." Aveve Cohen.